Smart Snacks are science-based nutrition standards for food and beverages provided to students at school during the day. Smart Snacks guidelines pertain to a la carte, competitive foods, fundraisers, and classroom snacks provided to students. Smart Snacks shall not apply to food sold during nonschool hours, weekends, and off-campus fundraising events. In accordance with USDA rules, the “school day” shall begin at midnight and last until 30 minutes after the last bell. In addition to legal requirements, the District shall establish age-appropriate guidelines for food and beverages at classroom parties or school celebrations and for competitive foods, as well as school-sponsored fundraising activities that involve serving or selling food as specified within the USDA Smart Snacks in School guidelines. Competitive foods are food and beverages sold or made available to students that compete with the school’s operation of the NSLP, SBP, and/or after-school care program (ASCP). This includes, but is not limited to, food and beverages sold or provided in vending machines, in school stores, or as part of school fundraisers during the school day. Elementary schools: Not allowed to be provided to students anywhere on school grounds throughout the school day except for those items made available by the school food service department. Middle schools: Not allowed to be provided to students anywhere on school grounds from 30 minutes before to 30 minutes after meal periods. High schools: Not allowed to be provided to students during meal periods in areas where reimbursable meals are served and consumed. Fundraisers sold at school shall follow the guideline set by the USDA Smart Snacks in Schools. Elementary classrooms may serve one nutritious snack per day in the morning or afternoon (not during meal times) under the teacher’s guidance. The classroom snack may be provided by school nutrition staff members, teachers, parents, or other groups and should be at no cost to students. 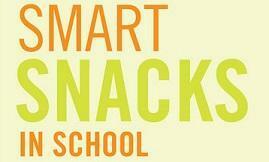 Snacks provided to students shall be in accordance with the USDA Smart Snacks in Schools Standards. The only exception shall be for parents, who may provide any type of snack(s) they wish for their child only. A list of authorized snacks shall be available upon request and as a link on the District’s website on the school nutrition page. Moody ISD does not sell or market food items to students that do not meet Smart Snacks standards. Moody ISD's Wellness policy does not restrict what parents may provide for their own child’s lunch and/or snack, but they may not provide restricted items to other children at school. A parent/legal guardian or grandparent may bring in any food product (cakes/cupcakes) for the classroom on his or her child’s birthday. * Allow balloons, decorations, gifts, and the like. The principals shall have discretion on when to allow the consumption of the food products. The food products cannot be consumed or provided to students during meal periods or in areas where reimbursable meals are served and consumed. Parents must contact campus administrators to make arrangements for the distribution of food items.